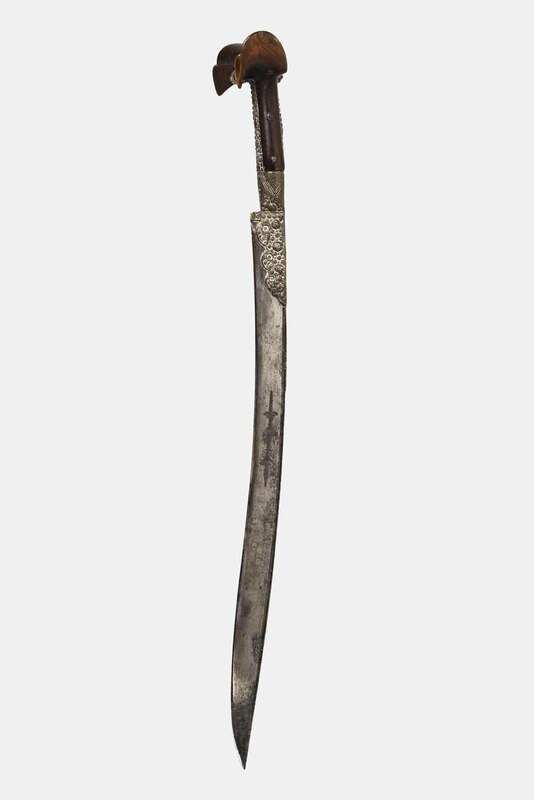 Turkish sword with a steel blade, with a simple edge, ornamented with a Qur’anic sentence on one side, and a floral arabesque on the other. Both sides are engraved in inlayed silver. Wooden hilt in the characteristic shape of “ears”, with silver appliqués, in the centre, which are carried through the upper section of the blade. Espada Turca com lâmina em aço, de gume simples, ornamentada com uma frase do Alcorão num dos lados e arabesco floral no outro. Ambos gravados e com prata incrustada. O punho é de madeira no característico formato de “orelhas” com aplicações em prata, ao centro, que se prolongam pela zona superior da lâmina.